The pharmaceutical industry is among the world' s largest industries in terms of turnover, with revenues of more than $600 billion in 2008. The industry certainly plays a central role in maintaining our health ' 1] ' but it does so generally by producing between 25 and 100 kg or more of waste for every kilogram of active pharmaceutical ingredient (API) manufactured. For comparison, the petrochemicals sector produces 0.1kg of waste for every kilogram of product produced. Of course, commercial volumes of drugs are much lower, with an annual production of between 1000 to 1 million kg per compound, compared with basic chemicals that are produced in billions of kilograms per year. Nevertheless, even at a nominal disposal cost of $1 per kg, the potential savings just in waste avoidance is significant, being in the range of 500 million to 2 billion kg per year . API molecular structures are generally complex, the syntheses are lengthy, and patient safety demands very high purity. In addition, unlike their chemical-sector neighbors, most APIs are made in a batch mode rather than by continuous processing, using obsolete chemical conversions in solution that consume large amounts of solvents and heavy metals dissolved therein that function as key reactants. By applying the "green chemistry" principles  (Figure 4.1) to redesigning existing manufacturing processes and to designing processes for new drugs, waste reductions of more than tenfold have been achieved. These reductions provide a double economic benefit to companies because more of the raw materials they purchase end up in the products and less waste needs to be disposed of. Here, again, major advances have been made in the last few years that are generally in the field of nanoscale chemistry science and technology, affording several key chemical technologies whose potential, in terms of benefits to industry, the environment and society, is finally being realized. 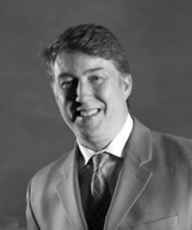 The Green Chemistry "evangelist," American chemist Paul Anastas, published the manifesto of the new, clean chemistry in 2000. Image courtesy of Professor Paul Anastas. How can we achieve the same end-product using a different set of inputs and reactions such that we eliminate waste from the process? 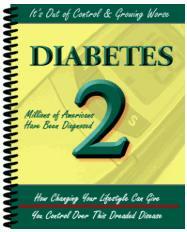 By developing new, effective catalysts. Unlike other reagents that participate in a chemical reaction, a catalyst is a substance that is not consumed by the reaction itself. Its role, instead, is to enhance the rate of a desired chemical reaction. Eventually, by reducing waste and the costs associated with disposing of or recycling that waste, this approach to synthetic chemistry based on catalysis ends up saving companies money. In particular, wasteful "stoichiometric" processes are being replaced with clean catalytic conversions using solid catalysts. This allows elimination of the separation step of the catalyst from the reaction mixture, recovery of the costly catalyst, and fast consecutive conversions with easy separation from the products in the reaction mixture. Oxidation of hydrocarbons into highly useful oxygenate derivatives now takes place smoothly with oxygen using nanoporous catalysts. duction of waste, and avoiding the use of corrosive, explosive, volatile, and non-biodegradable materials. All these requirements may eventually be achieved by designing the appropriate solid catalyst made of nanoporous solids that meet stringent demands in terms of sustainability, feasibility, and economic viability. As another example, so - called C-H activation is of central importance throughout the fine chemicals industry and new heterogeneous catalysts have been developed successfully. Many highly selective oxyfunctionalized hydrocarbon products may now be produced using O- or air (or a solid source of active H- O2- as oxidants under environmentally benign conditions, often requiring no solvent . A typical example is the conversion of styrene into styrene oxide (Figure 4.2). No protection groups are required for these industrially significant conversions, but advantage is taken of single - site heterogeneous catalysts to achieve the required selectivity. The trick, once again, lies in our new ability enabled by nanochemistry advances to design nanostructured solids in which well-characterized active centers are anchored to the framework of the inner walls. 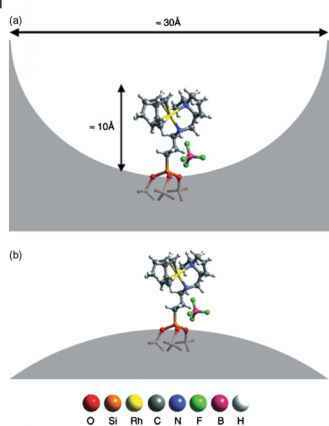 The very general concept is analogous to the one-century old Fisher's "key-in-the-lock" principle that explains the selectivity of enzymatic reactions, and holds large validity also in heterogeneous catalysis for fine chemicals synthesis within the nanoporosity of solid materials (Figure 4.3) . Clearly, at the concave surface, access of the substrate to the catalyst is favored only when access takes place along the axis of the pore; whereas no such restrictions exist in the case of the same catalyst anchored at the convex surface. 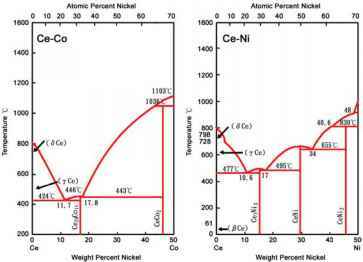 This explains why in the first case the selectivity is considerably higher and has opened the way to bringing chemistry to a confined space. Eventually, chemical syntheses will be carried out with the same kind of work flow as happens with the modern construction of a car, by performing catalytic reactions safely and with greater control, one after another, in a continuous microreactor (Figure 4.4), namely in a small tube designed to remove or introduce heat from or into a reaction precisely and with great speed . This graphical model of a catalyst anchored to a silica surface shows the constraints when the surface is concave (a) or convex (b). Reproduced from Reference , with permission. New chemical syntheses in industry will be carried out in microreactors equipped with catalytic nanomaterials performing catalytic reactions one after another until the desired product is obtained. Photograph courtesy of EPF Lausanne. Microreactor technology is already an efficient tool for kilogram- scale syntheses in continuous mode and is particularly effective for hazardous reactions that do not allow scale-up in conventional reactors. Applications to several classes of reactions are described herein, including highly exothermic reactions, high-temperature reactions, reactions with unstable intermediates, and reactions involving hazardous reagents. Again, to find widespread use in industry, suitable nanocatalysts will have to be developed for such microreactors that couple together multiple catalytic transformations in series. Catalysis over efficient heterogenized catalysts enabling one-pot, multistep synthesis offers in principle a solution to most of the problems encountered in pharmaceutical syntheses . The large amounts of solvents and purification media currently employed by industry would be eliminated along with the lengthy processes that originate them. Yet, until recently heterogeneous catalysts in the fine chemicals industry were remarkable for their absence despite the fact that until the early 2000s many homogeneous catalytic systems could not be commercialized because of difficulties associated with separating the products from the catalyst' This obsolescence was mostly rooted in the nature of the fine chemicals industry, which is a product (and not a process) oriented industry, that is, it focuses on the development of new products to maximize revenues in the time span in which exclusive rights are granted by patenting innovation . As a result, traditional heterogenization technologies of homogeneous catalysts were characterized by a poor level of performance in terms of activity, selectivity, and stability. Current economic hypercompetition, however, and ever stricter environmental regulations are bringing about a radical change in industry. Companies went back to academia to work together on the development of various solid catalysts for high-throughput organic synthesis. Catalysis by sol-gel "doped" materials-porous metal oxides confining an active species-has emerged in the last 10 years as a prominent tool to synthesize a vast number of useful molecules both in the laboratory and in industrial plants . The term "sol-gel" generally refers to a low-temperature method using chemical precursors that can produce glasses with higher purity and better homogeneity than high-temperature conventional processes, in various shapes, including powders, fibers, coatings and thin films, monoliths, and porous membranes. 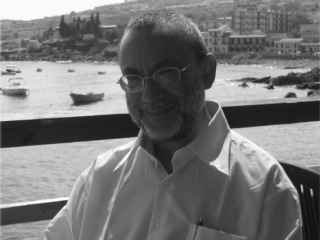 Israeli scientist David Avnir, a chemistry professor at The Hebrew University of Jerusalem, has established the field of sol-gel organic hybrid materials. Photograph courtesy of Mario Pagliaro. accessible to diffusible reactants through the inner pore network and give rise to chemical interactions and reactions [ 11] . The sol- gel entrapment largely enhances both the physical and chemical stability of the dopant, whereas the overall materials act as a chemical sponge: chromatographic materials that adsorb and concentrate the reagents at the cages surface where reactions take place. Following the 1984 discovery, it was rapidly established that any organic molecule, including enzymes, could be entrapped and dispersed within the inner porosity of such glasses with full retention of the chemical activity and marked stabilization of the entrapped dopant molecules. The domains of organic chemistry and ceramic materials were merging and the new era of inorganic-organic hybrid materials had started . Despite its simplicity, the concept has tremendous implications and the field has rapidly evolved into the so-called "sol-gel science and technology:" an advanced domain of chemical research capable of affording sophisticated catalytic materials that offer unique versatility and many new useful properties. The alcogels in this picture are ORMOSILs doped with a Ru molecular species called TPAP. 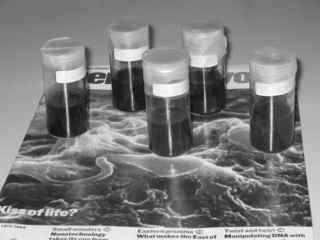 Upon a mild heat treatment these materials become more active than TPAP in solution. Photograph courtesy of the author. a sol-gel entrapped catalyst shows higher selectivity than either a homogeneous catalyst in solution or a catalyst surface- bonded to a non- porous material. In most applications, silica is the matrix of choice. This is because silica has several advantageous properties that make it an optimal commercial support for solid-phase syntheses, including stability towards harsh conditions, low swelling, and consistent binding sites for the catalyst (Box 4.1). The Canadian based company SiliCycle Inc., for instance, commercializes a vast variety of functionalized silica gels as advanced reagents for the pharmaceutical and fine chemicals industries. Even better, instead of silica as such, sol-gel organically modified silicates (ORMOSILs) have shown enormous potential as catalysts for selective conversions in advanced organic chemistry. In these nanohybrid glasses an intimate mixing of molecular alkoxide precursors in organic solvents is realized that allows organic and inorganic components to be associated at the molecular level to form real organic-inorganic nanocomposites. For example, the versatile aerobic oxidation catalyst TPAP (tetra-n-propy-lammonium perruthenate) - which shows modest activity in promoting alcohols oxidation when entrapped in a pure SiO2 matrix - entrapped in nanoporous partially hydrophobized silica (Figure 4.7- is far more active than the catalyst dissolved in toluene (Figure 4.8) . 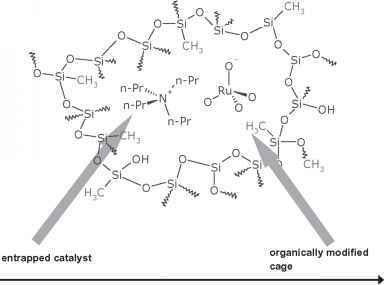 Given the industrial relevance of catalysts using oxygen as a unique "aerobic" oxidant, the catalyst was commercialized by SiliCycle under the trademark SiliaCat® PerRu. Silica is surface functionalized and reacts much faster than conventional polymer bound reagents where the reaction is slowed by the rate of diffusion through the polymer and can be slowed further by the polymer's ability to swell. Silica works under a wide range of conditions: in all solvents, organic and aqueous. It has a high thermal stability and can be used in microwave applications. Unlike polymers, silica is easy to weigh and handle with no static issues and is easily amendable to automation. It is mechanically stable, works in any format, and is easily scaled. It requires little or no washing because it does not swell in any solvent. Sol-gel caging of a dopant (TPAP, in this case) is versatile. In addition, a methylated ORMOSIL such as the one represented here is an ideal aerobic catalyst. Image courtesy of Mario Pagliaro. Oxidation kinetics in the aerobic conversion of benzyl alcohol into benzaldehyde in toluene mediated by 10mol.% TPAP encapsulated in the sol-gel hydrophobic matrix A-Me3 (■) and unsupported (□). Reproduced from Reference , with permission. The first sol-gel commercial catalyst reached the market in 2005 thanks to the Swiss company Fluka, which commercialized hybrid glasses doped with the industrially well- known lipase class of enzymes (see below). A more recent example is SiliaCat TEMPO (TEMPO = 2,2,6,6-tetramethyl-piperidine-1-oxyl), a metal-free "off-the-shelf' solid catalyst made of hybrid silica suitable for the conversion of alcohols into delicate fragrances or carboxylic acids. Fragrances (Figure 4.9- are generally made of aldehydic molecules, and especially unsaturated molecules. The catalyst SiliaCat TEMPO can smoothly afford large yields of aldehydes without the serious drawbacks in terms of selectivity, metallic wastes, safety, and harsh conditions posed by older processes used for this fundamental transformation (Figure 4.10). As stated in the 1920s by Ernest Beaux, the perfumer who created Chanel n°5, in perfumery "the future lies primarily in the hands of the chemists;" indeed, it is the chemist who finds new fragrances (aroma chemicals) for both perfumery and personal care products by synthesizing and thus creating new, original notes.